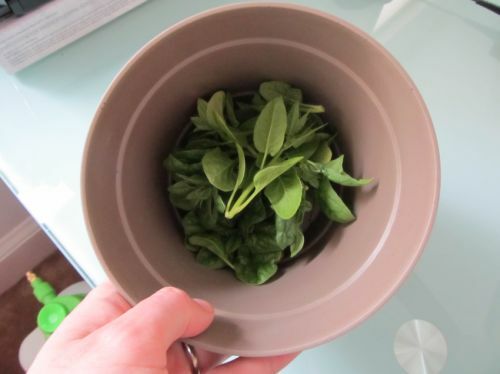 The spinach I planted in March never got quite as big as I would have hoped, and this week the plants started to flower so I went ahead and started snipping before things got too far. What you’re looking at is a very tiny bunch of baby spinach. It might be enough for one meal. I have much higher hopes for the bok choy which is starting to come in nice and strong right now. The snow peas are also starting to flower so I should be able to start harvesting peas in the next week or two. I’ve put out a few sweet pepper plants, even though the soil might still be a bit cold for them at night. Two plans are doing pretty well and one is struggling. I’ve got a few more plants indoors which I might put out after it gets a little warmer outside. Last weekend we went out in search of strawberries to transplant, only to learn that it’s actually quite late in the season to get strawberries started. Still, I did find two plants at the Home Depot which seemed reasonably healthy.They didn’t come from an organic nursery, but I transplanted them into a container with pesticide-free soil and I’ll be treating them as organic from here on out, so hopefully anything they went through early in life won’t affect the crop too much. I just figured I’d like try to get some strawberries into the garden this year, although I might not harvest any fruit until next summer if the little guys look like they need more time to get settled. I might also add some new plants next spring. Finally, today I started soaking some green beans in hopes of pre-sprouting them. I probably should have started that a little while ago, but I’m hopeful that I can get some sprouts quickly so I can direct seed a few plants outdoors in the same planters as the snow peas (so they should be coming up as the peas are starting to come down) and keep a few indoors in case the outdoor seedlings don’t fare so well right away.